BEE is a free online email editor designed to build responsive layout emails. "The best email builder in the market"
"Simple, quick and easy template design." The ability to have the images hosted via Bee and to just keep everything contained within the service is great. I personally export my emails to HTML and I write a fair chunk of my own HTML in the emails. The designs that are provided are extremely professional and they make it really easy to give a professional look to your brand. The ability to write your own HTML is great, as there are times when this will be necessary and the support for doing so it great. We use Go for our e-mail service and all our emails contain "template variables". We can easily insert these anywhere in the e-mails and it's a flawless experience. I don't like the lack of functionality to make a truly customized e-mail. Something like being able to split the email into 12 columns (like a lot of CSS frameworks) would be great so that if we do have to write our own HTML - we can use classes such as "col-8" and "col-4" which would auto-magically stack on mobile if toggled. I would like the classes the BEE uses to be documented so we can use them ourselves. I would also love to be able to build my own "HTML components" to re-use. If you need extreme customization, it might not be the best. BEE provides structured templates and content areas for you to build a good email in a simple way. You can write your own HTML inside of BEE and it's mobile-first which is amazingly useful. I'd absolutely recommend this to most businesses that want to design reliable, good-looking emails. BEE provides the useful benefit of not having to worry about compatibility across multiple archaic email clients. It's nice to have an interface that handles this all for you. What Email Template Builder solution do you use? "Powerful and enjoyable to use"
This is so much better and easier to use than any of the built in editors of popular email service providers. Using the included templates you can quickly customize an email's look and feel and be off to the races! Hard to find anything not to like - the only thing I could say is that it doesn't directly integrate with Drip who we use for our marketing emails so we have to export the HTML and then put it into Drip manually. Not a big deal but would be neat if that step could be eliminated. If you're looking to level up the look of your emails, this is the best app for it and is a great value. We've tested many other similar apps and services and BEE wins, hands down for us. We needed emails that aligned with the look, feel, and caliber of our brand. The way emails were looking with more standard templates weren't up to par, BEE helped us with this! "An amazing email design tool that has saved me HUNDREDS of hours!" I love the vast variety of templates that BEE offers to help launch your project fast! I have found a template for almost every need my business has had. Their easy to use drag and drop design tools make it super simple and efficient to put together an email with limited time. I for one, am not the best designer, but with BEE I look like a pro! Although BEE offers many integrations that enable you to export your templates to your email handler, I do wish they offered a solution that enabled users to send the emails to their client lists right from the platform. Also, the ability to remove the branding when sending a test email would be a nice bonus! I am primarily a back-end web developer. I don't do much design work, and that because I am not great at it. BEE helped solve this issue for me in regards to Email designs when I am tasked with developing one. It saves a TREMENDOUS amount of time for me! "Bee is fantastic email design for non-designers"
We use an Email provider that provides zero support and you basically have to be a programmer to use it. Although this saves the company tens of thousands per year, I was faced with basically having to learn HTML to make a decent email, and even then they would look terrible. Because BEE lets you use templates, drag and drop sections, and drag and drop individual design units, it's the most flexible design tool with the most style that I have found. I can even import everything into my email provider of choice with zero programming skills. I wish it was easier to import the images. We use Mautic, and I ended up having to use the image hosting option because Mautic would not upload my images. But, the image hosting option is cheap and easy, too. I wish I could use BEE for email hosting as well. It would also be nice if I could make other necessary elements, such as landing pages or feedback forms through BEE. Not having to have a programming and design degree to send nice looking emails. BEE is simplistic, easy to use and VERY flexible compared to other email builders. You have the ability to add social tags, background images, and export as HTML to use on any email sending platform. I love that we are able to create multiple projects and templates - but my favorite part of using BEE are the AMAZING modern, responsive pre-made email templates that they provide you. There is a template for virtually any reason/use and they are designed to get high open/click rates. Since using BEE we have seen our email opens move from 5% to over 20% - with our best performing email last year getting a 70% open rate. I highly recommend BEE to any marketer looking to find a quick, cost-effective, and easy solution to building beautiful HTML based emails. It would be great to have the ability to export emails directly to Pardot! This would allow us to eliminate an extra step of exporting and importing the code to Pardot, and ultimately allow us to insert Pardot variable tags to create targetted messages to our audience. TRY IT OUT! You will probably be very pleasantly surprised at how easy to use and functional the application is. We have been able to build beautiful, modern looking emails that function perfectly with our Pardot CRM. We had much higher engagement rates since starting to use BEE - with our highest performing email receiving a 70% open rate. "BEE is easy to use and gives you the ability to make great looking responsive emails"
The amount of templates that are available is a huge help in getting inspiration to create your own template. I find that I utilize the product best when I review the available templates and then use the create new feature to build my own. It is very easy to use and the available content block sections make it so that you can quickly start from scratch and have a beautiful template created in no time. Also the fact that you can define custom fonts (specifically Google Fonts) and then easily use them in a template is invaluable. That you cannot hide an element on Desktop. Also that you cannot have elements in other elements. There are situations where I would like to have two columns and then in one of the columns have another multi column element. I also wish you could set the pixel width of the columns rather than being forced to use preset sizes. Get in there and try it out for yourself. You won't be disappointed. The ability to quickly create and edit responsive emails has been huge. "Saved us thousands of man hours"
I have zero coding skills and to create emails these days you need that. We have developers, but to take them away from app and web dev for crm was not an option. Enter BEE, and wow did it save time and effort for little to no money. There is even a free version, but we loved the product so much we upgraded the same week. Templates, graphics, you name it BEE has it for you. I would say that if BEE could add how it would look on different browsers and email clients, such as outlook, gmail, etc that would be amazing, because sometimes that can be a slight issue.. Engaging email and design. Before we were sending really bland emails. And while our open rate was high there was very little click through. With BEE we were able to test so many different things very quickly. Beautiful templates and no coding skills needed. This product is so versatile and easy to use. It's great for all skill levels. No design experience necessary. Also offered at a great price. Excellent value. Unable to create saved custom modules (custom column widths, content combos). You have to use the ones that come pre-designed and work within that framework. Also, the numbered and bulleted lists don't use the same fonts/font sizes as the text, so we usually use custom HTML, so that the design looks more consistent. This product saves so much time and it's got loads of features to help you up your email game. We have an email platform that does not natively support responsive design, and you have to know a lot of HTML to really format correctly. BEE makes this process simple. We design the email in BEE, then export the HTML into the email platform, and it's ready to go. "100% Recommend for anyone who needs to send newsletters"
Bee is fantastic - no more worrying about the crazy type of coding required for email clients, no more digging through code to make minor changes. Bee makes it SO EASY to create nice looking custom emails and is a lifesaver - since we added it, we've been able to send out more newsletters than ever due to time saved. The team is also actively upgrading it - it was perfect when I started using it a year ago, and every couple of months the Bee team adds new useful features. I 100% recommend this, especially since you can test it out for free, but I highly recommend to get the paid version as it allows you to save your newsletters online. Bee originally had some bugs like issues with dragging and dropping and image uploading, but the team upgraded and fixed them and now Bee is so extremely worry-free that I love using it. If you are considering Bee you can test it out for free very easily. I definitely recommend to get the paid version though so you can save your newsletters. Benefits: We can send newsletters more frequently AND more different types of newsletters since it is so much faster! "This really is the best email creation tool out there!" Friendly interface, possibility to organize templates into folders, and a super fluid drag and drop editor to creat absolutely amazing emails. It is really simple to export in one click to use in any emailing tool you may be using. The tool also has the possibility to push the html code directly into various tools like Mailchimp, Hubspot, etc. The support guys are also very reactive, and very helpful in case of any issues like integrations, etc. Pro tip - many other tools out there actually use the Bee Plugin to power their edites: AutopilotHQ, Customer.io for example! Not much really - would have loved to design my landing pages using the tool, but sadly that's not what the tool is meant for! Being able to create beautiful emails without writing a line of code! I love how simple the drag and drop builder is. The design potential is endless. The third party integrations are the icing on the cake. Some integration issues with Mailchimp. Some formatting comes in funky as ? 's throughout the body of the email. I've reached out to support and haven't gotten the most thrilling of support to figure it out. I have disconnected and reconnected the service integrations. Make BEE part of your work-flow and you won't be sorry! It's intuitive and browser based app is so easy to use! Utilizing bee and mailchimp as the ultimate combo as helped us with our analytics and generating dynamic content that people want to open. Since switching to BEE, our open rate has gone up! "So far one of the best email building tools I've used"
Bee has a much more fluid layout capability than the standard MailChimp layouts are capable of. You can move modules around and have just a little more customization with text, layout etc. I also like that they are implementing a more streamline process to get the templates into MailChimp. I wish there was further customization yet with the layout and how large the font will go. Great for going a step up from MailChimp, but also be sure you can export it into a compatible format for whatever mail server you are using. I'm creating more on-brand emails with the content laid out more to our needs. This is hugely beneficial so that our company emails aren't bland and off-putting to our customer. "I don't know how we found BEE but it saves us so much time. " I love that we can design all of our content, keep it organized, and updated as needed all from one source. The builder is nicer than Mailchimp's, and the formatting is consistent across virtually every platform we've checked it against so our email designs look like they should. Managing elements (which we host) means we have to develop a workflow. Being able to link to our image rep so that we don't have to manually insert image links would be nice. Still - not a huge problem. We send email from three different platforms so having a single tool that allows us to design for all three without error saves a ton of time and frustration. "It is intuitive and easy to use"
The flexibility to design as I need to. Without using any code. There some littles glitches, nothing major, but sometimes it keeps the text with links underlined even if I have specified not to. In these cases, I make a new block and it is ok. It feels like there is a bit of code that stays stuck, somewhere. I like to use it to design mail signatures, but there is always a margin on the left. I would like it to stay fixed at the left side. I would LOVE to have a «undo» feature, as it such a natural go to option for a designer. I can design newsletters for myself or for my clients without using code. With the flexibility I need to follow certain establish design guidelines. In the end it looks personalized. And I can export the files so that the clients can integrate them to their system. More and more clients want an interactive, personalized email signatures. It is the easiest solution I have found so far. "Great addition to HTML Email Marketing"
Super easy to use and implement. Even able to train other staff very easily to update newsletters and export to our mass email program. I like it because salesforce has a useless basic mass email template creator, so I use Beefree instead and just drop the html in. Also, Beefree's auto-save is legit the best. Unbeatable. Price for an on-top solution is totally worth it. Sometimes it hangs up on photo edits and it can be a smidge glitchy with text formatting, but I'm being really picky, b/c it's worlds easier than writing in html. !! I cannot reccommend this product and price point enough. It's the perfect price point for an on-top solution for mass emails. It's so easy that it saves time on every email send because I don't struggle with building the email I really want. I can showcase our company at its best on even simple emails. Delegating newsletters to a staff member is so awesome. Great templates that customers love and super-customization for all sorts of uses. We have several email marketers on our team that are not advanced in html coding but need the ability to create templates for our sites and emails without bogging down the Digital and Design teams with daily projects. BEE has been a fantastic solution to allow them to work in a sophisticated template creator and subsequently import the coding into our ESP. I wish you could grab the html coding directly from the site vs having to download the html file to get it, but it's a matter of 10 seconds to go that extra step so it isn't a deal breaker. If you need a product that will help a wide range of content creators and their levels of experience with html and design, BEE is hands-down a winner. We use BEEPro and it has proven a cost-efficient solution. Email creation for a wide range of html coding expertise. Our less experienced marketers can create their own templates and emails. Additionally we can view shared projects so if more than one person is working on something we can easily access and make edits to the templates as needed. "Excellent tool for professional mails"
What I like the most about BEE is that it is easy to use, online and free. Bee has many templates to customize your emails and its interface is quite intuitive which makes it easy to create your emails but this does not mean that emails are not professional. It is a very useful tool to create more serious emails for partners, customers or suppliers. In addition, it has a good customer service that solves doubts and attends to your proposals and ideas to improve the tool. The only negative is that the free version can be very limited. For example, it does not allow you to save the design of your mail online, you have to download it. I recommend trying this tool if you want to create emails that catch the attention of the receiver. You can do it cheaply, quickly and without having much knowledge in design. It is ideal for small companies that need to save budget in programs of this type. If you like to use it, you can get the full version. The tool is called Mailup actually. BEE has helped me create professional, eye-catching and responsive emails without having much design knowledge of emails. In addition, you can do them quickly and easily. "The Best email designer tool going"
I have used them all and I can't say enough good things about Bee. Interface is simple and very intuitive. Most importantly their code passes all the tests. Their code works on all devices, all clients. Export is a breeze. I would be very sad if I should ever lose access to the Bee. And the price is well below it's worth. Nothing worth mentioning honestly. Nothing worth mentioning honestly.Nothing worth mentioning honestly. Don't waste your time with others. Bee works. Period. Email communications that work on all devices and all clients. Easy export to our system. "Great tool for easily creating email templates"
I love the huge variety of sample templates offered which allow you to easily tweak a design as opposed to building something from scratch. There is also a ton you can play around with even in their free tier which is appreciated. While the drag and drop editor can be easy to use, it's sometimes frustrating getting certain images and text blocks to line up in the finished email. The content blocks can be somewhat rigid at times. Definitely worth playing around with to see if it suits your needs! BEE allows us to spend more time on the content of our internal newsletters by providing beautiful out-of-the-box templates that we can simply tweak. This ensures the content of the message is more likely to be read and reviewed. "An amazing online application "
I know some would prefer the conventional way of doing newsletters by building from the scratch. i implore not to view this review as some marketing stunt and give BEE a try. as it has greatly improved our delivery time, saved money and greatly improved the way we do newsletters. The price plus its capabilities...easy to use drag and drop interface. Great selection of templates and blocks. Its just a no brainer! I do wish that subscribtions did come with image hosting. I really do not need it however it would save a little time not having to host the image myself and then add it to the email. If you are looking for an easy to use and mobile responsive email editor, this is a wonderful tool. No download required, I can work on it anywhere that I have internet connection. The email marketing tool we use to send emails had a horrible HTML editor with its product. 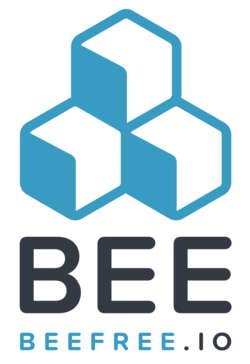 BEE has given us beautiful content and more interaction with our customers and prospects. "Best Email Editor Out There "
BeeFree makes it super easy to create professional looking emails. The ability to export quickly to my preferred mail client of choice is huge and the fact they take care of all of the crappy Outlook/MS Office code for me is HUGE. "Excllent. Clean. Easy. Exports too!" Create and export the html with images, our #1 need. Very easy to use your templates and then personalize or creatively adjust. 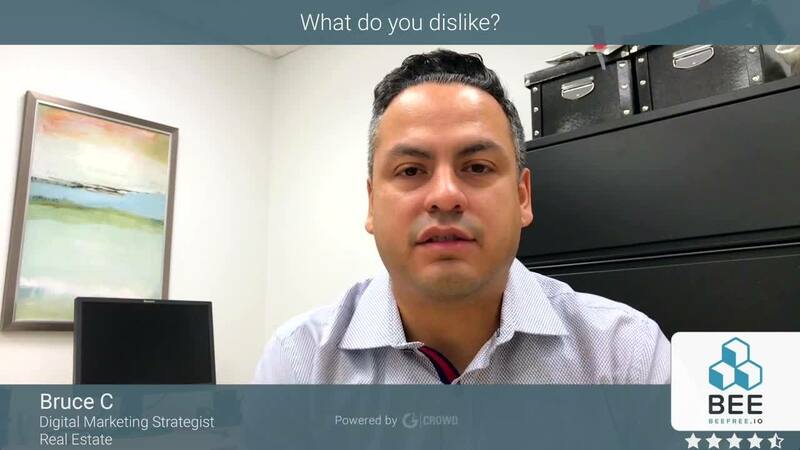 Dislike? Nothing. We do really need team level for 2-3 users, granted $0 - please. Other Suggestions: we could use the ability to insert specific other fonts! Direct "send" connection from Bee our Bronto or NetSuite email service. Quality/reflexive e-communications, and newsletters are a cornerstone of our 501c3 relationships. Staff are incapable of creating these without your simple creative tool, and export the final product to our bulk email service (NetSuite and Bronto). Without Bee only 1 person had the skills, so Bee has opened up this essential to more staff now. Thank you. "Best email blast builder on the market"
Bee has great templates, easy to use, the code is clean and it also offer image hosting. For free. The interface is really neat and helps everyone at every level to build their responsive emails. I am not really a big fan of the global UX of the platform, but it doesn't bug me much anymore after some practice. I would love to have more templates available as a start. I absolutely recommend using it if looking for a fast and very cheap solution to build small html pages or email blast. I am building responsive email blast for marketing purposes, I also used it to create custom HTML templates for landing pages, loading pages, and generally speaking most of the common html code for simple uses. Drag and drop features and also ready to use templates make it so unbelievably easy if you, like me, used to build HTML templates from SCRATCH! Sometimes things do not align as you wish, but most of the time it can be fixed. This will simply your life, trust me. Not only are templates easy to use, but everything can be so well organized within the product. You can easily duplicate templates, also, which is a super practical feature. They also have several options for export which is helpful. The testing features are also practical. You can see what your template looks like on mobile vs desktop. Very useful for email marketing campaigns. I've used this previously at my other job, and brought it with me at my new job. I find it is the easiest tool to use to build newsletters! We have used BEE to send out communicative newsletters via email to the company where before no one had truly access to information. It has helped shed light on a lot of internal issues and questions/conversations arose from these newsletters. Beefree has helped us ramp up our email game. Before bee free, we would send emails in the forms of pictures. Now we can make fully customizable email templates without knowing HTML. The one thing I can think of to dislike beefree is that there are not many new templates. We wish they would add new templates weekly or monthly to keep things fresh. Use them to develop email blasts that will improve your email game. We are getting a better response rate on emails while using Bee free. It's great that we can export the emails directly to mail chimp too. Bee makes it super easy to create HTML templates for email campaigns. As someone with minimal knowledge about HTML, i don't have to look at more code than i can handle! This site rocks. Managing my current projects is not completely user-friendly, but it's manageable. This service takes out the need for coding custom email HTML, and ultimately helps me save time when deploying email campaigns. "Huge time saver and frustration reliever"
In my work, I send out large email marketing campaigns and the service we use is not set up for email design. The rudimentary tools have literally driven me to tears and wasted countless hours. BEEfreeio has been a frustration reliever. It's super easy and flexible and streamlines the process of importing the design. As a human factors engineer, I can be pretty picky about interface design but this product is pleasing and intuitive. I have not come across anything that I dislike thus far. I am able to create much nicer looking emails for our clients! "Easy to use and lots of value"
Creating professional looking marketing emails to communicate with out database. It's allowed us to avoid hiring costly marketing companies to create these emails for us. "Email Design/Coding for Graphic Designers"
I like the flexibility to set up different layouts and that it is automatically mobile friendly. I would like to see more options for mobile stacking, substituting images for mobile, etc. It helps to have an understanding of basic HTML coding so that you can get into the code and fine tune anything that needs it. There usually isn't much, but you can really improve upon the overall look and functionality if you can do this after downloading the code. We have significantly cut down on the time it takes for an email to be created. "I Bee therefore I create"
Simple interface and process to build responsive emails. Can do more than email and integrates with MailChimp nicely. Has saved us hours of time, saved money and we don't need freelance programmers. Responsive email designs in realtime without the days and weeks to perfect code. I love how simple it is to use, but the emails I am able to create look great. There is not much I don't like about Bee! Simple to learn and adds so much value to email marketing. Our email CRM provides limited options for building emails. Bee allows us to build much more visually appealing emails. Easy to design, easy to download the html code. Limited ability to customize the mobile view. Try the free version to get a hang of how it works, then you can upgrade in order to save past projects. I am easily able to pump out beautifully designed emails for clients without needing to code every thing. "Beefree is Email Design Headache Relief"
I love that Beefree is drag and drop OR designer/css friendly, giving padding options, etc. yet spits out code that respects responsive requirements. Only a few minor hangups getting a design from the free version into the paid upgrade account, but quickly solved by support. Beefree saved me a ton of time producing a responsive email template design. "Excellent online email development tool"
It was extremely easy to develop a responsive HTML email for passing off to a mail provider. I hadn't developed email outside of a mail platform before and was unsure where to start. It was the second tool I tried, and worked wonderfully. Downloading the file was a breeze as was passing it off. It would be nice to save my design in the free version, but not a big deal. Downloading it allowed me to make any last minute tweaks. needed an HTML email to provide to a 3rd party. BEE made the development of a responsive email easy. The ease of creating great looking emails plus all the amazing premade templates! Salesforce Pardot integration functionality would be super handy! The Pardot email building capability is horrible, their premade templates are quite dated and bland. Having a send to Pardot button after building an email in BEE would be AWESOME! Once again, we use Pardot as our marketing software - their email templates are so hard to use. Having BEE free makes it so easy to create amazing looking emails and copying them into our Pardot. "Best "responsive" email services "
Easy to use, to export and how quick it's possible to have a good looking emailing. Having a responsive email which fit perfectly on mobile. Most of our customer use mobile to read newsletters, with Beepro, customer engage more than before. "Really slick email construction package"
greatWYSIWYG editor, and really nice styles available. "The best drag and drop email editor in the universe!" I have tried every drag and drop editor out there and can confidently say that Bee is hands down the best. I can’t say enough about how effective this tool is for efficiently creating professional, truly responsive emails quickly. It’s super easy to use- even for folks who don’t know code or design, they seem to get the hang of it really quickly. Can’t say enough about it, huge fan! Very little- plus, their support team is really responsive and are happy to add items and fixes to their release schedule. Give it a try- the trial is free so what have you got to lose? Speeding up the email design process- enabling non coders to create emails that are beautiful and responsive. "This is essential for any and all companies!" You have the ability to choose from several professional quality templates to send out. I have used it at my last company for engaging internal emails. My new company is going to purchase a year subscription to send out emails to customers. Amazing! Would like to see more templates. Sometimes the solution is slow when there is a lot of content on one page. Makes internal emails more engaging. Perfect product for any HR/Sales/Maketer! "Affordable with lots of options!" It connects directly with our email platform, MailChimp, and has a variety of great templates that include beautiful designs with interactive content. We aren't email designers on my team, marketing executives, so it makes us look like we have major skills in the area of email design. Learning curve is not as steep as other options out there, and it is pretty responsive. Like that they send friendly tips and tricks to harness potential of the software on a regular basis. More collaborative options for multi--users would be good, and more templates will be helpful. Well worth the try, especially if you don't wish to waste time writing HTML. Needed a WYSIWYG editor for email marketing mailers to customers to keep them loyal and remain top of their minds. "A great resource for creating and editing"
The ease of use, and the user friendly interface. My only wish was that there were a few more options for padding, and column customization. I am able to help my clients even more with a user friendly drag and drop editing experience. "Great Service, never had an issue"
very user friendly, nice templates & also easy to create emails with your own designs. have been using for a couple of years, no issues so far. "BEE offers flexibility and freedom to customize!" I like BEE because I can design my emails in this program and then transfer them to Mailchimp for distribution. I wish the in-app free distribution tools were better. I find that I prefer to send the emails through a different service but design them in Bee. We have used Bee to enhance our intra-office communication by sending out monthly emails. This makes our team more cohesive and keeps everyone abreast of what's happening in other departments. "Beautiful Platform, Super Customizable, Foolproof"
I started using BeeFree to make more visually appealing emails for my job. I love how customizable this program is. I can make an email look great by using the built-in features, or I can drag and drop html or images I have designed in Photoshop to make my message look stunning. I often forward on my emails, and I appreciate that they are even customizable within my email platform if I need to edit any information. The photo upload process is a bit slow. Sometimes images or html links don't show up in Outlook, which is very frustrating. Definitely one of the best platforms for easy email campaign creation out there! In a pinch, or without a CRM product, it works great! More visually appealing content, cutting back on words. I found that plain, normal emails were not getting much of a response, as they were cumbersome and intimidating. As I began formatting emails with more pictures and easy to navigate links, I found that I got more response. "Great product for making awesome emails!" The templates provided are great and the interface is very easy to use! Would like to have a little more flexibility in building the templates, especially with the social links. At present, the social links do not work when exported and can't be re-branded how they are currently. Standardizing our emails into templates. A user friendly place to edit and create emails. Solving for hybrid-fluid responsive templates for all emails. User interface is friendly and easy to use. I like how easy it is to create the exact layout I want without having to be an HTML coder. I use Marketo. If I want to refresh or create more interesting email campaigns, I had to have someone on staff with HTML and CSS experience. I am a marketing army of one... so BeePro lets me create the email I want, then export it off to Marketo. * We monitor all BEE reviews to prevent fraudulent reviews and keep review quality high. We do not post reviews by company employees or direct competitors. Validated reviews require the user to submit a screenshot of the product containing their user ID, in order to verify a user is an actual user of the product. Hi there! Are you looking to implement a solution like BEE?